For the first time in three years there will be a new top comedy at the Emmys after Veep took the year off in preparation for their final season. In the political comedy’s year off, Emmy voters nominated eight comedies in an insanely competitive race including four of last year’s nominees, a former favorite returning six years later, and three new favorites. In such a close race, an upset is possible but based off of nominations, momentum, and reviews the winner is likely between Atlanta, The Marvelous Mrs. Maisel, and Barry. Making this year even harder to predict is just how polar opposite all three major contenders are. Dramedies have had a historically difficult time winning the top award and all three contenders have been criticized about being considered comedies. All three major contenders come from unlikely networks – in fact only two non-broadcast comedies have won the top award and both came from HBO. On top of all that these comedies have never gone head to head although both Atlanta and Marvelous Mrs. Maisel have done well without direct competition. Emmy voters clearly love Atlanta after the sophomore season went from six nominations to 16 making it the most nominated comedy of the year and putting it in the same ballpark as past winners. Making this even more surprising is just how unconventional of an Emmy contender Atlanta is from its central themes to the fact that when the show premiered the ensemble featured relative unknowns that are now becoming some of the most popular names in Hollywood. Atlanta also completely won over just about every main branch with four acting nominations and possibly even more telling is its two writing and two directing nominations when other strong contenders were only able to earn one writing and one directing. That unconventional status might just be what pushes Atlanta to becoming the big winner of the night. No comedy had jaw-dropping watercooler moments quite like Atlanta has this year, especially “Teddy Perkins” the episode that might catapult the groundbreaking show to the top award. Emmy voters have never seen anything like it and it is by far the “cool” choice after being championed by critics to become the best reviewed show of 2018. The only question is will older voters respond well to it after years of voting for family sitcoms and workplace comedies? Making the comedy race even more complicated is the fact that Atlanta’s biggest competition is its polar opposite. 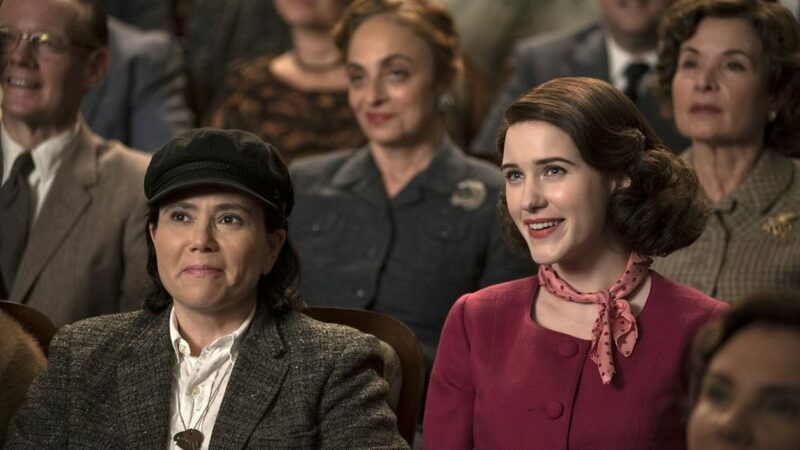 The Marvelous Mrs. Maisel in a lot of ways is a lot more traditional of a choice while simultaneously tapping into the themes of the moment following a woman fighting to make a career in the entertainment industry. Tapping into our cultural moment and utilizing a lavish 1950s period backdrop helps Mrs. Maisel come across as the obvious awards contender and a lot more palatable to older academy members. What makes the Amazon Prime comedy stand out as one of the best of the year is just how impeccably crafted the dramedy is. From the writing and directing to Rachel Brosnahan’s star making performance to the period design the show is mesmerizing to watch. At the hands of Amy Sherman-Palladino the entire season moves effortlessly and is by far her best work after years of work on show’s from the original run of Roseanne to Gilmore Girls. After over performing with 13 overall nominations Barry has quickly become the dark horse in a number of this year’s comedy categories. HBO is still the only non-broadcast network to win Outstanding Comedy Series and they are better than any other network at connecting voters with their content. It’s a well-known rule that Hollywood loves stories about Hollywood and Barry hilariously criticizes the selfishness of its own industry in a hilarious way. Bill Hader is well-liked by Emmy voters and voting for Barry might be looked at by the television academy as a way to celebrate Hader as a whole who also produced, directed, and co-wrote the show. Barry is also co-created Alec Berg – the super producer who over a long career is overdue for his first win after multiple nominations for Curb Your Enthusiasm, Seinfeld, and Silicon Valley. The other five nominees all have their pros and cons but likely don’t have the momentum to win. With eight nominees however anything is possible since it theoretically could only take 12.6% of the vote to win if it truly is a tight race. Before the nominations were announced G.L.O.W. was strongly considered a possible contender to become the first streaming comedy to win the top award. Emmy voters welcomed the wrestling comedy with ten overall nominations but simultaneously squashed all of its momentum when both Alison Brie and Marc Maron were shockingly snubbed in the acting categories. Still, the well-reviewed second season premiered just at the right time to excite voters as they filled out their ballots. After a long six year hiatus Curb Your Enthusiasm returned with a ninth season and the comedy earned four overall nominations. The Larry David comedy clearly has its core fans but it’s going to have a hard time convincing the larger television academy why it should represent the year of television especially without any writing, directing, or craft nominations. Silicon Valley earned its fifth consecutive nomination for Outstanding Comedy Series but the Alec Berg comedy has lost a lot of steam to Barry, Berg’s other comedy in the race. With seven nominations voters are clearly still paying attention to the tech-bro comedy but it doesn’t seem to have much momentum from fans on social media and the recent season received a lukewarm reaction from critics. Over the course of four seasons Black-ish has slowly earned more and more Emmy nominations. The family sitcom has been praised for finding ways to discuss political and social issues in a family friendly manner that harkens back to sitcoms of the 70s making the comedy standout in a category filled with cutting-edge premium and streaming shows. Unfortunately the fourth season took a lot of creative risks that didn’t always pay off like the three-episode separation storyline and the incessant focus on Dre’s workplace antics at the expense of the family dynamic that made the show successful in the first place. After Netflix dropped a shortened season at the last minute Unbreakable Kimmy Schmidt earned a surprise fourth nomination without any evidence that voters actually watched the season. Its only other nomination was for fan favorite Tituss Burgess and after years of never winning a single Emmy this isn’t the season that will change that.